James V. Schall, S. J. The second essay of Samuel Johnson’s entries in The Rambler was published on Saturday, March 24, 1750. The essay begins with what must be called a general experience of all mankind, thus including one’s own self-knowledge: “The mind of man is never satisfied with the objects immediately before it, but is always breaking away from the present moment and losing itself in schemes of future felicity.” This unsettled condition causes us to misuse the time available to us. We continually deal with things that never will happen. Surprisingly, Johnson is at pains to criticize those many wits and pundits who mock this tendency to wander off into the unknown future. “It is so easy to laugh at the folly of him who lives only in idea, refuses immediate ease for distant pleasure and, instead of enjoying the blessings of life, lets life glide away in preparations to enjoy them.” As a result, we do not “live” our lives but only prepare ourselves to live them. We are the kind of being whose progress is gradual. We act amidst alternative ways of doing the same thing. “The end therefore which calls forth our efforts, will be found, when it is once gained, to be only one of the means to some remoter end.” Such a passage, no doubt, is very close to Aristotle’s discussion of deliberation and decision, all of which are devoted to a final end that we seek in all our actions, the real root of our freedom. Johnson adds, in a memorable passage: “The natural flights of the human mind are not from pleasure to pleasure, but from hope to hope.” Pleasure is itself always an invitation to a final delight found only in the origin of our being in the Godhead. Too much emphasis on either the distant future or the immediate present can be debilitating. If we are going to a certain place, we must from time to time think of the destination to which we order our actions. “In agriculture, … no man turns up the ground but because he thinks of the harvest.” Johnson is aware that too much emphasis on either the distant future or the immediate present can be debilitating. “Few maxims are widely received or long retained but for some conformity with truth and nature.” In reading Johnson, one is always conscious that what Johnson says conforms with the common experience of mankind, an experience that checks our own tendencies to put our hopes only in our own ideas. “It frequently happens that, by indulging early the raptures of success, we forget the measures necessary to secure it, and suffer the imagination to riot in the fruition of some possible good, that the time of attaining it has slipped away.” Obviously, Johnson is aware of the relation between what we want and the effort that goes into attaining it. In fact, Johnson thinks that as a class, authors are the ones most susceptible to an exaggerated hope of success for their work. He offers some advice from Epictetus to counter this danger. We should think of the worst thing that can happen to us to prepare ourselves for the disappointment of not becoming as famous as we expected of our work. “There is nothing more dreadful to an author than neglect, compared with which reproach, hatred, and opposition are names of happiness; yet this worst, this meanest fate every man who dares to write has reason to fear.” No doubt this same concern will be found in the heart of every politician. Johnson here was concerned with how his own initiative in the newly formed Rambler would be received. If we go to the catalogue of any library, we will see, as Johnson pointed out to prove his point, name after name of men who expected to be great but who are now unknown. 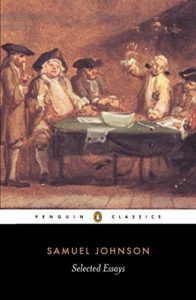 “But, though it should happen that an author is capable of excelling, yet his merit may pass without notice, huddled in the variety of things, and thrown into the general miscellany of life.” Johnson was aware that literary fame was dependent on more than the quality of an author’s writings. Many things go into making a book a success that are outside of the writing itself. If we survey the potential readers, we find that “Some are too indolent to read anything, till its reputation is established; others too envious to promote that fame, which gives them pain by its increase.” This latter definition of envy is right on the mark. Much more of the world’s problems are caused by envy than we are wont to recognize. Johnson concludes his reflections on the nature of writing in this way: “He that finds his way to reputation, through all these obstructions, must acknowledge that he is indebted to other causes besides his industry, his leaning, or his wit.” The art of writing flows from the mind of man as it encounters the myriads of things that cross it. On examination, nothing that crosses out path fully satisfies us. The passage from initial pleasure to hope retains its inner logic. Some indeed pass from pleasure to despair. But the existence of any good depends on the existence of the Good. This is why, in our writings and in our lives, we pass from hope to hope.